As expected, some conservationists are grousing about the plan. 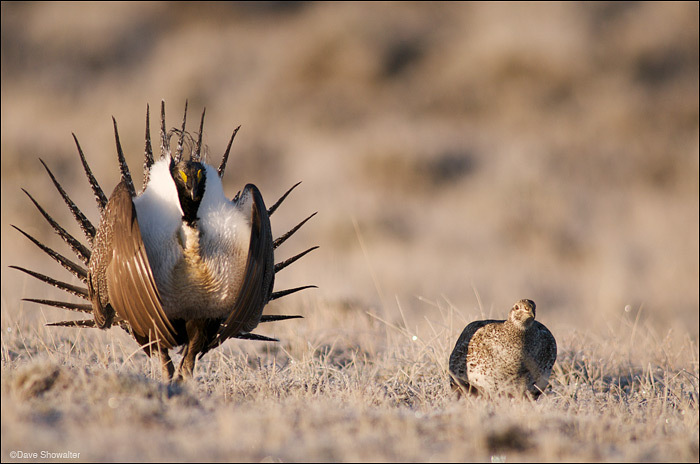 “In cases where BLM officials want to ignore the welfare of sage grouse and ram through projects that are detrimental, there will be little in the new policy to stop them,” Erik Molvar, a wildlife biologist with the Biodiversity Conservation Alliance, said in a release. “The interim policy is written with such loose language that BLM officials will have the latitude to do anything they want — or nothing at all — to protect the grouse.” I agree with Erik, and there’s credit due to the BLM and the Department of the Interior for taking imperiled sage-grouse seriously, whatever their motivations. Over the last decade of explosive growth in the gas fields, we’ve seen already compromised grouse in a population free-fall. Often described as a death by a thousand cuts, unrestricted, self-regulated industrialization is a dagger to the heart of the West. Scientists are fanned out across the sage, counting birds, trapping and collaring, discing, burning, planting, chemically treating habitat, marking fences to keep birds from flying into them, adding signage on highways, installing ramps in water tanks, buying easements and educating landowners; yet we’re still not giving grouse the minimum three mile circle around leks (mating grounds) that science tells us they need to have room to roam. One can imagine that every one of the 250,000 or so Greater sage-grouse is worth a million bucks or more. The core habitat strategy was developed by Audubon for their Sagebrush Ecosystem Initiative , and it’s the best we’ve got; but no one knows if it will work. My interview with Audubon’s Alison Holloran describes the early days of the sagebrush initiative and what grouse need for survival. Thankfully, grouse are on the Endangered Species Act’s (ESA) waiting list and there will be actions taken if the population collapse continues. It’s amusing that after decades of decline, we’re now seeing the BLM kick up some dust across the West. Why is that? Drilling and wind development could be stopped in its tracks if grouse get listed. While energy development isn’t the sole reason for decline, fracking is the single biggest change to Western landscapes since the gold rush and completion of the trancontinental railroad. Oil and gas development growth continues to accelerate, wind energy and other development will add more pressure to grouse and other species. While conservationists fear for grouse survival, land managers and industry fear for what an ESA listing would do to their plans to plunder the earth for every last hydrocarbon before America wakes up and starts holding industry accountable for the toxic soup they’ve injected into our water and air. I’ve written quite a bit here about natural gas’ impacts to wildlife, recreation, water, air, and Western heritage – it’s a driving force for my conservation work – and I’m pissed that we’re paying many times over for industry’s free ride. Sure, they offer some high-paying jobs and contribute royalities to local economies, but who’s paying for Western conservation? You and me, that’s who. Consider the celebrated Jonah Mitigation Fund. Looks good on paper right? So, Encana and BP have taken more than $700 Billion from the shale beneath the Jonah Field and contributed a paltry $23.5 Million in conservation easements to the Upper Green River Basin. Is less than 1% fair? Tiny Pinedale, with no stoplights has worse air in winter than LA, acid in high mountain lakes in the Wind River Range, and Benzene in an aquifer on the Pinedale Anticline. Oh yeah, and grouse in steep decline. Plans to save Greater Sage-grouse are well-intended; whether altruistic or driven by fears that industry will grind to a halt, that we’ll have another spotted owl situation on our hands. But no matter how you feel about the BLM’s plan, it falls short in its inability to see the West as a contiguous whole. Greater sage-grouse are an umbrella species; meaning that other wildlife who use sagebrush for food and survival benefit from grouse conservation measures. Virtually all Western wildlife spends some of the year in sage; and sage obligate species, those that are obligated to mate and raise their young in sagebrush have suffered declines that parallel grouse. This plan is bound to help, but until we value cores and corridors, migrations, wild rivers, riparian areas, and all of those small pieces that add up to a functioning, sustainable West, above the almighty fossil fuel, we are destined to pass on a toxic, industrialized mess for the next generation to deal with, and that aint right. What we need is a coordinated Western Legacy Act with a vision for a sustainable future and the courage to protect large areas, linking landscapes, and giving wildlife Freedom To Roam. The path we’re on isn’t sustainable and we haven’t seen the full impacts of fracking. We’re like bison being herded to a buffalo jump (by industry) with the precipice in view. Are we brave enough to change course? Posted in Endangered Species, Energy, Sagebrush Sea on December 30, 2011 December 30, 2011 by Dave Showalter.